Articulate Presenter lets you specify the timer format used for embedded Articulate Quizmaker quizzes. 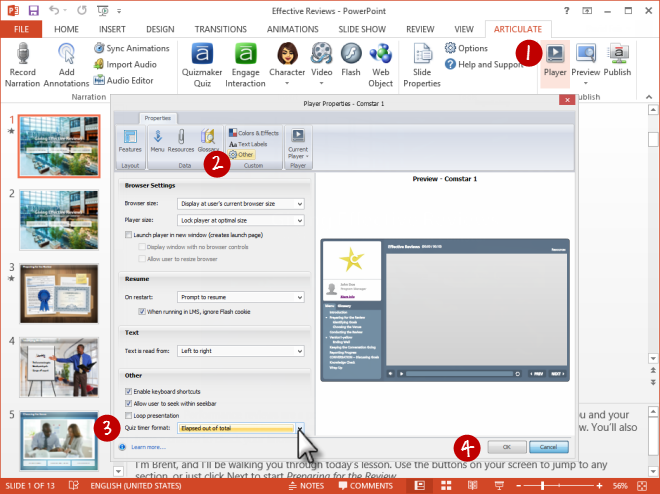 Go to the Articulate tab on the PowerPoint ribbon, and click Player. Click Other on the Player Properties ribbon. Use the Quiz timer format drop-down in the lower left corner to choose a timer format. Tip: The format you select will be applied to all embedded quizzes where the timer is enabled. While Presenter controls how the timer is displayed, Quizmaker controls whether or not it's enabled. Do the following for each quiz in your course to change the timer properties. 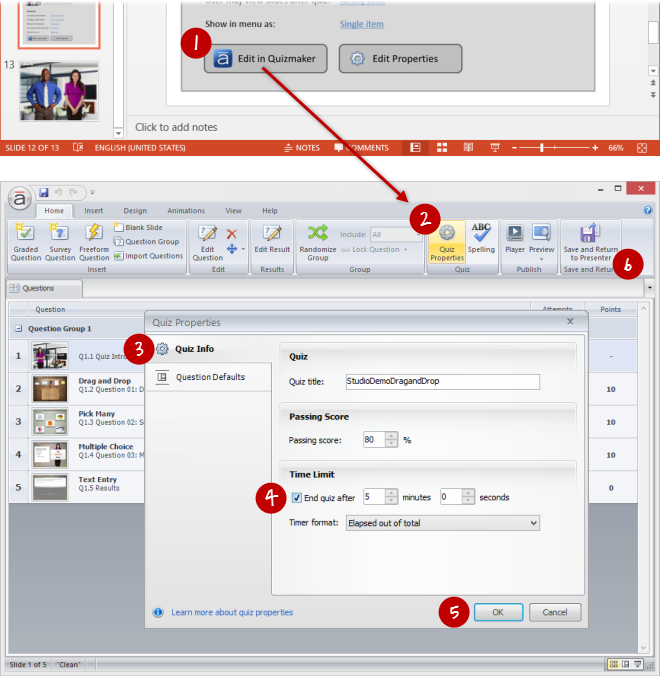 Go to the quiz placeholder slide in PowerPoint, and click Edit in Quizmaker. When Quizmaker opens, go to the Home tab, and click Quiz Properties. Select the Quiz Info tab in the upper left corner. To turn the timer on, mark the box to End quiz after, and enter the number of minutes and seconds. To turn the timer off, uncheck the box to End quiz after. Click Save and Return to Presenter. Tip: The Timer format in Quizmaker applies to standalone quizzes. It's superseded by the Quiz timer format in Presenter when quizzes are embedded in PowerPoint.